Welcome to the Clermont County Recorder’s Office. I hope this web site will provide you with a better understanding of the responsibilities, services, and public records maintained in our office. Our public records CountyFusion Search Website will give you access to the records available online. 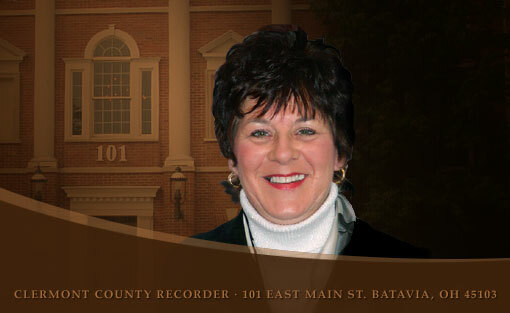 Records unavailable online can be accessed by visiting our office located at 101 East Main Street in Batavia, Ohio. The professional, dedicated staff of the Recorder’s Office will be glad to assist you by phone or during your office visit. Our goal is to provide the public with accurate records that are easily accessible and made available using the most affordable technology. We continually strive to improve and maintain excellence in record preservation for Clermont County. DID YOU RECEIVE ONE OF THESE LETTERS? The Clermont County Recorder’s Office has seen recent increase in calls regarding the cost for obtaining a “certified” copy of a property owner’s deed. Property owners are receiving letters from private companies offering their services to obtain a certified copy of their deed for them at cost of $80.00 or more. These companies are getting public information from property transfers. They ARE NOT attached to any government agency although some of the company names would lead you to believe they were. All property deeds are public information. As county recorder, I would like to let you know the true cost for you to receive your deed, mortgage any other document recorded in our office. The fee for a copy of a document is $2.00 per page and $1.00 for the certification. The average deed consists of three pages and the dollar charge for certification will cost you a total of $7.00. Quite a difference in cost for these companies that want to charge you $80.00 to $90.00 for the same exact thing they are getting from our office. The staff of the Recorder’s Office will do this while you wait. It should take five to ten minutes of your time. You may also request a copy by mail by sending in the correct fees and a self- addressed stamped envelope for your document to be returned to you. You may also print out a copy directly from our CountyFusion Website. If you have any questions regarding this please contact our office at (513) 732-7236. Our office hours are Monday through Friday, from 8:00 am until 4:30 pm. A. A universal file format that preserves the fonts, formatting, colors, and graphics of any source document, regardless of the application and platform used to create it. PDF files are compact and can be shared, viewed, navigated, and printed using free Adobe Acrobat® Reader® software, downloadable from http://www.adobe.com. On this page you will find some files we hope will be helpful to you. Click on the link below the description to download the file to your computer or you may pick the print option. This way you can print the file and if needed fill it in by hand. Please contact the Recorder’s Office with your questions. NOTICE: The materials available on this website are for informational purposes only. Please consult a professional for a better understanding and the correct use of the material here. Documents executed outside the United State or in a language other than English must have an English translation attached and a Certificate of Translator completed and attached to the document. The certificate state the the translator is competent and the translation is accurate. Click here for a Certificate of Translator. The base fee for recording a document is determined by the number of pages in that document. The fee chart has pre-calculated the fees for documents from 1 page to 50 pages. To calculate the fee for documents in excess of 50 pages please use our online fee calculator, click here to use the calculator. Click here to see the Fee Chart. Quick Time Player is software that allows people to view and download many file types. Quick Time will sometimes cause a problem when viewing files on the LandAccess web site. This is a brief guide to stop using Quick Time to view the images on the LandAccess site. Click here for the Quick Time guide. Effective July 1, 2009 Ohio Revised Code 317.114 created standardization guidelines for documents that are recorded. Plats, DD214’s (Military Discharge), documents generated by a taxing authority and documents executed prior to the effective date do not have to meet these standards. This law requires a twenty dollar additional charge should a document not meet the standards. This document is a representative template, not actual size. Click here for the Standardization Guidelines template. Ohio Revised Code 5302.221(C) states: A county recorder shall obtain a properly completed form prescribed under division (B) of this section from the beneficiary of a transfer on death designation affidavit or the beneficiary’s representative and send a copy of the form to the administrator of the Medicaid estate recovery program before recording the transfer of the real property or interest in the real property under section 5302.222 of the Revised Code. The Ohio Department of Jobs and Family Services has developed the required form in the above mentioned statute. The form is called Notice of Medicaid Estate Recovery of Pending Transfer of Property by Transfer on Death Deed or DJFS07408 form. Click here for the DJFS07408 form. © 2019, Office of the Recorder | Clermont County, Ohio. All Rights Reserved.